The term Visual Observing is generally used to refer to observing with the unaided eye. Its advantage is its simplicity. It involves minimal cost and there is no need to deal with any technology. In a visual meteor watch the watcher goes outside on a clear dark night, well away from full Moon, and observes the sky for as long as possible, recording what is seen by either writing it down, or by speaking into an electronic voice recorder. About five nights to either side of full Moon each month are rendered more or less useless for meteor work by its presence. The actual nights lost vary slightly during the year. You could, of course, merely sit back and enjoy the display. It is always better, however, to keep a record of what you have seen, either (preferably) to forward on to the Meteor Section or simply to have something to look back on at a later date. A second option is to simply count the number of shower and non-shower meteors given in a given interval (and maybe also record details of any particularly memorable meteors). This avoids the risk that you will miss seeing a meteor because you are still recording the one you have just seen. However, it can be also harder to maintain alertness without the “interruptions” to record details of meteors seen. Counts are sometimes also used at the times of very high meteor activity. The preferred method, the “standard” meteor watch, is to record the details of each meteor seen. The following notes describe how to prepare for a meteor watch and the information to record during a “standard” meteor watch. Most of the instructions still apply if you are merely carrying out a count, but in count-only watches you would omit the details relating to individual meteors. 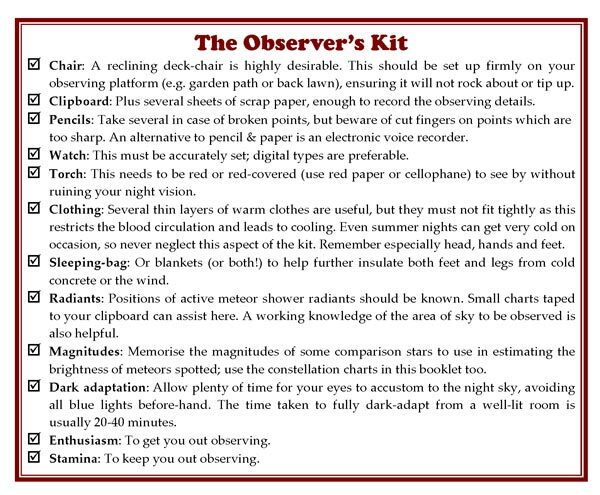 Some basic items of equipment useful for most types of nocturnal outdoor watching will be required, which we can call “The Observer’s Kit”, as detailed below. It is vital to remain warm and comfortable at all times, or your concentration may wander away from the sky. It is equally important that you should not be so tired as to have to struggle to stay awake. Observations are only worth doing while you remain alert. Drinks or snacks taken out should be consumed or disposed of only during breaks in your watch, to avoid accidental injuries. Note that caffeine in tea and coffee only helps prevent sleep, which is not the same as helping to keep you awake and alert! Always be well-prepared. You should watch as large an area of sky as you comfortably can. More meteors will be seen at about 40°-50° from the horizon than elsewhere and this is also a good optimum distance from a radiant to watch for shower meteors. Beware of flashes from satellites, aircraft or iridium flares which can look rather like very short or point-source meteors(these are meteors travelling directly towards you and resemble brief points of light like a star). Satellites and aircraft will usually reveal themselves by repeat flashes nearby soon afterwards. Birds, bats, moths and even windblown leaves can sometimes catch stray lights and may look very meteoric, though they often fly on erratic courses, not the straight-line trajectory of meteors. Do not fix your gaze in an area for too long, as your visual system rapidly becomes “bored” that way, and your field of view may become a uniform grey. Moving your eyes to a new spot should alleviate the problem immediately. Watches should continue for as long as possible, in practice as long as clouds or fatigue permit. A minimum duration of one hour should always be attempted, assuming conditions do not intervene, while the maximum could be as long as the night. Very long watches – six hours or more – should not be undertaken lightly. However, never give up on a watch, or the possibility of one, too early. Cloud or haze may move away in an hour or two, and much better skies later could be missed. Weather forecasts on television, radio (especially local bulletins) or the Internet, can be followed as rough guides to what might happen, but they are not infallible! Naked-eye report forms for recording your watch details are available from Section officials or can be downloaded from the website. Alternatively, you may find it more convenient to compile your report via applications such as Word, Excel or Notepad. All of these are acceptable as long as they contain all of the key information described below. For hand written forms, always make sure you fill in the forms as neatly as possible, using the reverse where there is insufficient room to give the information on the front. Any mistakes should be crossed out with a single line and the correct data added clearly nearby. Please refer to a copy of the report form while reading this section. The top part of the form refers to items concerning the whole watch. Date: Always give this as the double-date over midnight no matter when in the night the watch was done, in the form year/month/date. For instance, a watch started at 1.15 a.m. on December 14th 2016 would have the date 2016/12/13-14. Site: Note the name of the nearest town or village to your observing site and the county. If possible, also specify the latitude, longitude and approximate height above mean sea level of the place you observed from. If in Britain, this information can be found on an Ordnance Survey map of the area or via the Internet, or by using a portable GPS device at the location. Lim. Mag (LM). 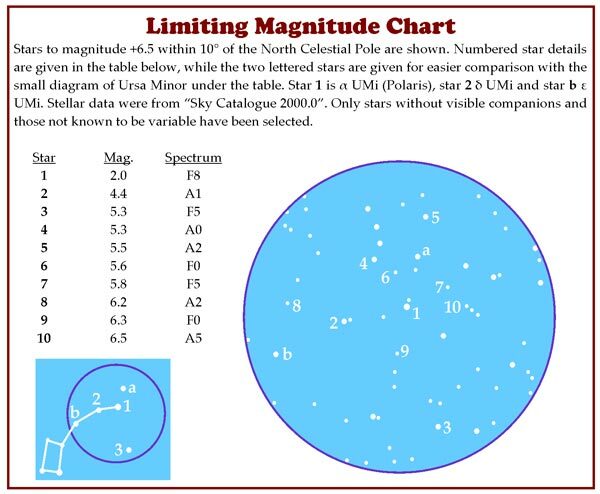 : This abbreviation stands for “limiting magnitude” and is a measure of sky clarity. It is defined as the magnitude of the faintest star you can just see with averted vision, using exactly the same level of concentration as while meteor watching. Ideally, this should be for the area of sky observed, but the chart alongside showing the area near Polaris in Ursa Minor can be used instead. If possible, before you go outside, look up the brightnesses of several faint stars in the area of sky you are planning to observe. Any changes in the lim. mag. must be recorded on the report form together with the times at which they happened. The best lim. mag. you can expect is about +6.0 to +6.5 in perfect skies, but +5.0 to +6.0 is common from many better UK sites. The faintest meteors visible will be mostly one or two magnitudes brighter than the lim. mag. If the lim. mag. is much worse than +5.5, observed meteor activity drops rapidly, so a dark-sky site is worth seeking. A bright Moon will of course adversely affect the lim mag, but bear in mind that you will still see more meteors in such skies near the peak of a major shower, such as the Perseids, than you would in moonless skies on most other nights of the year. Conditions: If clouds are present, estimate the percentage of your field of view obscured by them (NOT for the whole sky). If this changes, record an average value about every 15 minutes. With an average of more than 20% cloud in an hour, observed rates tend to fall quite quickly. Other items to mention here include the presence of the Moon, haze, fog, mist or anything else you feel to have been of importance. Watch Times: Record all timings in Universal Time (UT), the same as Greenwich Mean Time, GMT. When British Summer Time (BST) is in operation, one hour must be subtracted to convert BST to UT. The time should always be quoted as a 24-hour clock, e.g. 11:10 p.m. GMT becomes 23:10 UT; 12:27 a.m. GMT becomes 00:27 UT. Start and End your watches at a specific time, rather than waiting for “just one more meteor”, note these times down and give the watch Duration in hours and minutes. Remember to allow for any “dead” time during breaks or while you were not watching the sky (e.g while recording details of meteors seen). The bulk of the form is set aside for recording details on each individual meteor seen. Use at least one line per meteor when writing up your observations after the watch. In the field, as little time as possible should be spent taking notes on a meteor, but ensure that all the relevant facts are correctly put down. Portable voice recorders can also be used for this purpose, although they need to be protected so as not to malfunction when in damp, cold, outdoor conditions. The form columns, and hence items to look out for, are as follows. Time: The meteor’s appearance time to the nearest minute in UT. Timings to the nearest five seconds should be given for unusual meteors or fireballs. Mag. : This stands for magnitude, an estimate of the brightness of the meteor to the nearest whole magnitude, as compared to some known nearby stars at the same elevation as the meteor. The constellation charts nearby can be used as a guide. Remember not to skip magnitude 0 which lies between magnitudes +1 and -1, and note the minus sign “-” if the meteor was of negative magnitude. Type: A meteor’s type is either shower or sporadic. Always give the shower’s name to avoid any ambiguity, either in full or using the standard IMO three-letter code given in our Meteor Showers List, and “SP” or “Spor” for sporadic. A rigid straight edge such as a ruler or broom-handle is very useful for tracing meteor paths back across the sky to see if they belonged to a given shower or not. If the path did not seem to intersect with a known active shower radiant, then the meteor was a sporadic. Rel. : “Reliability”, a measure of how well you saw the meteor, using an A, B, C scale. Class A = very well seen, Class C = poorly spotted or where some details were uncertain, while Class B = everything else. Suspected or doubtful objects should not be recorded at all, and do not be surprised if many of your meteors are of Class C.
Train: Some meteors, after they have gone from the sky completely, leave a persistent glowing wake or train of ionized gas after them. Only a few bright, usually swift, meteors will leave a train, and the length of time taken for it to fade from view should be estimated in seconds or partial seconds as accurately as possible. With long duration trains lasting sometimes for minutes (very rare indeed), a degree of spreading or kinking may be apparent owing to high-altitude winds, and if this is seen a series of sketches should be done to show what happened. Note that the train has nothing to do with the time the meteor was seen in the sky for, nor the length of its path. The train is visible only after the meteor has vanished. Notes: This column allows the further description of the meteor. Features such as its relative speed (very slow to very fast), any exceptional colour, sudden flares in brightness, or any flickering should be noted here. For fireballs, try to fix the path through the stars, or with respect to landmarks on the horizon in the case of a rare daylight fireball. Give this as a sketch, or use a star atlas to give co-ordinates for the start and end points of the track. Remember to note the direction of movement too. Finally, and only if using hand-written forms, after you have written up all your meteor details, fill in the Sheet _ of _section at the top right-hand corner of the forms, noting which sheet is which for the night in question and how many sheets were used that night in total. For instance, if three forms were used to record a night’s observations, they should be numbered Sheets 1 of 3, 2 of 3 and 3 of 3 respectively. Watches made on the same night can be recorded on one form, or set of forms, but mark all start and end times clearly and give a total duration for all watches on the night as well as for individual watches. Observations made on separate nights must be recorded on separate forms, however. Accurate visual meteor work requires observations from individuals, but several individuals can observe from one site, each recording their own data only. Conversation in such a group should not be too distracting for the watchers, but can be very useful in helping everyone stay alert. Alternatively, “fun” groups of 4-8 observers plus someone to record the details can be organised, covering the whole visible sky. A rota is needed to ensure the recorder does not get too bored. Only details on the time and type of each meteor need be taken, as well as the general watch notes, since the information cannot be analysed in any serious way. Even this type of watch can have some interest and value however, particularly if part of the group spots a brilliant meteor, for example. Such watching is best carried-out only near a major shower’s maximum. 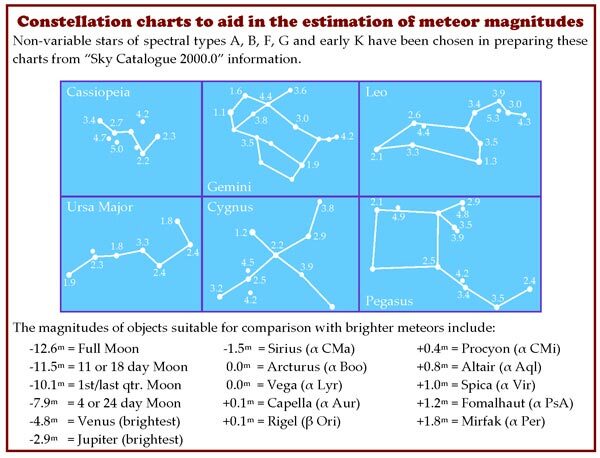 Casual observations of meteors may be made by chance, perhaps when out checking the sky, or may be carried out by individuals or groups who are outdoors at night, but who are not intending to carry out a formal meteor watch. These data can have some use too, providing they are promptly reported to the Section. This is most important for fireballs, but reports on the run-of-the-mill objects seen during a known time-interval can provide an interesting comparison with those made by observers who have been sky-gazing especially for meteors. Another type of casual watch is that carried out from indoors, perhaps through a window or a conservatory roof. For meteor enthusiasts stuck indoors through illness or injury, this can provide a welcome boost to morale, providing a night around a major meteor shower maximum is selected. The restricted field of view will naturally hamper observing, but when meteor rates are notably high, such as around January 2-4, August 10-14 or December 12-14, very acceptable meteor numbers can be spotted. If you are travelling to a dark-sky site to observe in a group or as an individual, remember to obtain permission from the landowner before setting off, and note that such observing is undertaken solely on the initiative of the people involved. The Society for Popular Astronomy accepts no responsibility for the actions of its members, and the name of the SPA may not be used in any connection. Fireball brightness estimates are never easy, as convenient comparison objects are rarely close by. Above magnitude -5 (Venus), there is only the Moon as a guide, and converting from an area of light (the Moon) to a point (the meteor) brings its own problems, so the brilliance of such meteors is usually more guess than estimate. The commonest case is to overstate the fireball’s brightness, so it can be useful to be critical of your own estimates and to keep your bright-source calibration up to scratch by checking the apparent and actual magnitude of Venus regularly, as well as the various lunar phases. Shadows may be cast by meteors as “faint” as magnitude -7 or -8 at times, though this fact is often used to suggest a greater brightness. If in doubt, use a possible range of values, e.g. -7 to -9, rather than a specific figure. Anyone spotting a fireball, whether on a meteor watch or not, should report it to the Section as soon as practical. See our Introduction to Fireballs webpage for more advice.